What a tool for Breakout traders! 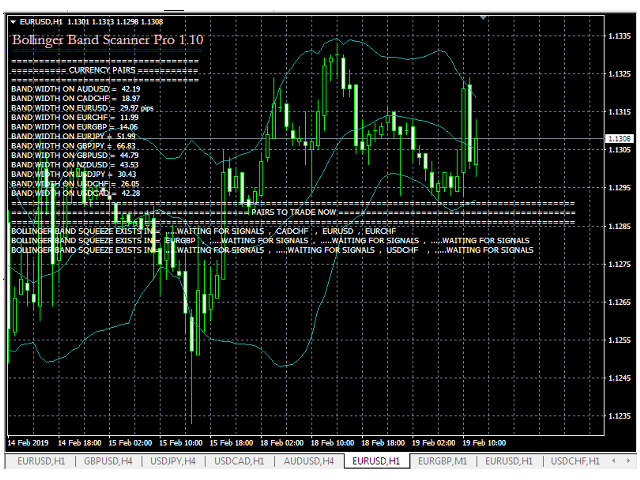 Trend traders and scalpers can also use it to know exact time and price level to enter and exit the market. It is an indicator that look for Bollinger Band squeeze on multiple pairs in market and give the result on a single chart. It is very easy to use. With this indicator, many pairs can be traded with its analysis show on a single chart. With default setting, it should be used on 1 hour timeframe and can be placed on any chart. It can also be customized by using different setting for any timeframe. 1. Drag and drop the Indicator on any chart. 3. Open the chart of the pair. 4. Apply Bollinger Band (Bollinger Band Scanner Pro's default value) on the chart. 5. Put Buy stop at the desire distance above the upper band of the Bollinger Band. 6. Put Sell stop at the desire distance below the lower band of the Bollinger Band. 7. Stop loss and target point can also be set at your own desire. 8. Unfill position can be cancelled if one has been filled already. NOTE that if you are using 5 digits quote account. You need to multiply the input parameters by the value - 10 except parameters - BandsPeriod, BandsShift and BandsDeviations. Display_Indicator_Name - if set true, Indicator name will be displayed on the screen. TurnOnAlert - if set true, Indicator will produce alert whenever there is band squeeze on any pair. BandsPeriod - value of Bollinger Band Period. BandsShift - value of Bollinger Band shift. BandsDeviations - Value of Bollinger Band deviation.